"We were told to stay home," she said as she stood in below-freezing temperatures, hoisting a sign that said "Not a pawn." "We're here to stick together with people who are trying to earn respect from a government that seems to have lost its way," said NYSUT President Andy Pallotta. Rep. Paul Tonko called the non-payment of federal workers "painful, unnecessary... and dehumanizing," adding that the shutdown has created situations that put our nation at risk for food safety, airline safety, air travel, and families in need. 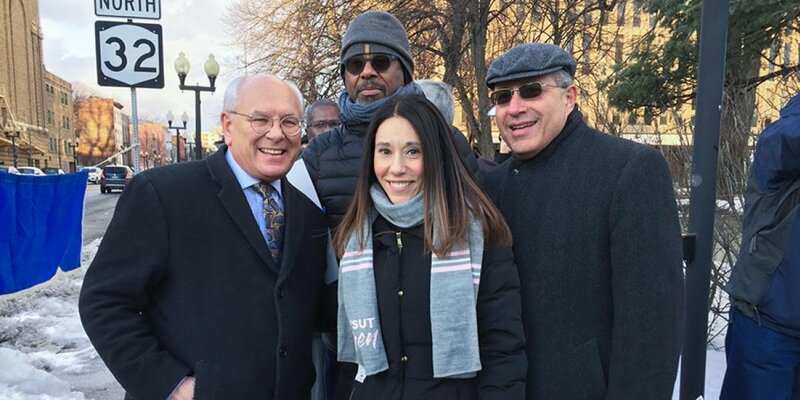 "When times are tough you need friends," Pallotta said, thanking Tonko for supporting workers. Some federal workers have been asked to continue to work without pay. In testimony at today's rally, laborers told stories of families spending money on gas, tolls and bridges to get to work each day - without getting a paycheck. "What's happening is a disgrace," said NYSUT Secretary-Treasurer Philippe Abraham, saying it is a fundamental right to work and get paid. "American workers should not be used as pawns," said NYSUT Executive Vice President Jolene Dibrango. Retired Albany teacher and labor activist Bill Ritchie called the federal actions "an attack on working people" and the poor, and warned people to brace themselves and prepare for mass action. "We have to keep up this fight. We're in a bigger crisis," said Rev. Emily ONeill, director of the Labor Religion Coalition of New York State, noting the many forces that continue to demonize public sector workers and unions.